Film review by Jason Day of The Commuter, an action-packed thriller about a train commuter selected to assassinate another passenger. Starring Liam Neeson and Vera Farmiga. Diligent and hard-working life insurance salesman and former cop Michael (Liam Neeson) is a nice guy. He has a content home-life with his wife (Elizabeth McGovern) and two teenage sons, one of whom is about to start College. And he enjoys his job, guiding people toward the right policy for them. One day, his boss fires him for not hitting enough targets due to his moralistic salesman style. Boarding his train home, he is approached by the nice and seductive Joanna (Vera Farmiga) with a proposition. He will receive $100,000 in cash if he puts a tracking device on another passenger. She gives no further details but makes it clear she knows him very well. Michael is interested, but as he tries to locate the passenger, he realises he is being set up to be blamed for their murder and works to make sure they and the other passengers leave the train safely. The tag-line should for this should have been ‘Attempted Murder On the Hudson North Express.’ And it stars Liam Neeson as a gruff, Irish Poirot. I approach Neeson’s films of late with a creeping sense of foreboding and familiarity. Familiarity because he only seems to play one type of role these days, that of the nice, vaguely middle-class family man thrown into the most ridiculous of situations by menacing outside organisations. Usually, he is stuck on some form of vehicle. Presumably, he’s also earning an awful lot of money to boot, considering how popular they are at the box office. A lot of these movies are directed by the same man, Jaume Collet-Serra, the genius behind such fare as Unknown (2011) Non-Stop (2014) and Run All Night (2015). He also directed The Shallows (2016), a film I much admired and greatly enjoyed, so he can be forgiven forays into comparative crud. Why does Farmiga trust a stranger, whom she knows to be a thoroughly upright and dependable old man, to help her kill someone? As an insurance policy, she also has a trained killer on the train who bumps off an undercover FBI agent, mistakenly identified by Neeson as the person Farmiga wants. So, why not have him investigate the passengers and bump the right one off? Day return, or season ticket? 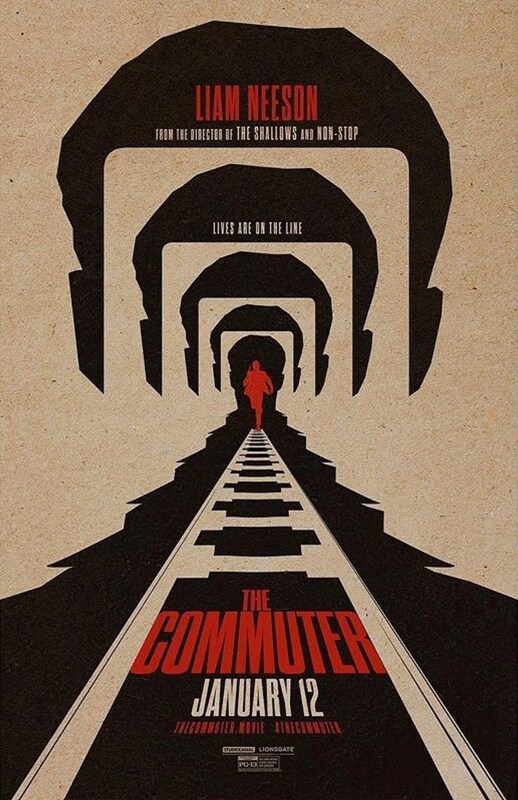 Vera Farmiga and Liam Neeson strike a deal in The Commuter. Of course, then there would be no drama featuring our regular hero Neeson. Still, as the nonsense unravels, you notice that you don’t really mind the chasms in common sense. Why did I not feel as if my intelligence (and time) has been wasted watching this production? You notice throughout some cheekiness here and there, some sleight of hand on the the performers’ part. There are a few sly, aside glances from a girlish Farmiga as the femme fatale with bright eyes and a snake’s smile. Neeson looks up with wonderful surprise as a derailed train carriage hurtles toward his head. There are sarcastic digs from ‘generation snowflake’ conductor Adam Nagaitis, more interested in seducing recently dumped nurse Clara Lago than asking how she is after the train crash. The film is by-the-numbers action crud but, goddamnit, these people are going to ring some fun out of it! As with Murder On the Orient Express, each of the supporting players plays a possible ‘witness in peril’ and through Neeson’s questioning, they are each allocated two minutes or so of screen time to explain their movements and motivations to him and us. Despite the shaky writing, Collet-Sera invests crucial time in his characters and, without exception, all of these little performances shine and suspend your disbelief in the action as a whole for a few, vital seconds. Collet-Serra also stages a very good opening credits start to his film. Neeson and his family rush in and out of their kitchen over a number of weeks. People coming in and out, different conversations, everyday life is sped up to a swift and smart couple of minutes montage that neatly compares the family to the hustle and bustle of the train station Neeson heads to every day. Preparing us for the solitude Neeson experiences when he tries to needle out of his quick cash plan, the credits finish with his fellow commuters melting away, leaving him a lonely, forlorn figure on the concourse. So, where next for Neeson? After the car-based kidnappings and chases in the Taken films, to the airplane in Non-Stop and the train-board shenanigans here, could he further mine the transportation action sub-genre still further? Think about it, we could see him in Skateboarding Scumbags, Hovercraft Hooliganism, Moped Muggings. The man could clean-up at the box office until his retirement! For more, see the trailer on the official website. Producers: Alex Heineman, Andrew Rona. Writers: Byron Willinger, Philip de Blasi, Ryan Engle. Liam Neeson, Vera Farmiga, Patrick Wilson, Jonathan Banks, Sam Neill, Elizabeth McGovern, Killian Scott, Shazad Latif, Andy Nyman, Clara Lago, Adam Nagaitis. Three Billboards Outside Ebbing, Missouri (2017). Film review of the satire starring Frances McDormand.